Karl Hauptmann was born on 25th of April in 1880 in Freiburg i.Br., Germany. He received his artistic training in Nürnberg and Munich and was thereafter engaged as a decorative painter. 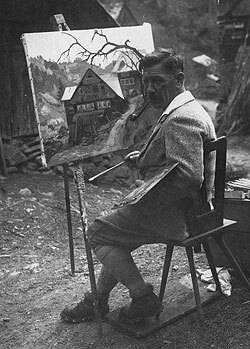 In 1908 he produced the first of what were to be his typical Black Forest paintings. In the years between 1915 and 1919, he produced numerous images of the Alpine region he had visited during his deployment with the mountain infantry in the First World War. In 1918 Karl Hauptmann purchased «Molerhüsli», which for him encompassed his dwelling, atelier, and exhibition space. It soon became a favourite meeting place for skiers, hikers, students, and visitors to Feldberg. Due to Hauptmann’s ever-present health problems, his doctor prescribed a trip to Italy in 1940, to which he again travelled the following year. On 7th of April in 1947, Karl Hauptmann died at the age of 67 at his «Molerhüsli». Lit. : Exhibition Catalogue, Feldberg, 1993. If you have always wanted to know what has sold at our auctions during the past few years, you have come to the right place. You have the possibility to search all our catalogues dating back to 2004. At your leisure, please take a moment to review our online catalogues and highlights as well as our result lists for every single auction. Please note that the individual catalogue entry descriptions are currently only available in German.